Oh The Treasures You Can Find! I don’t think that it is any secret that I love thrifting. That is, perusing and shopping at thrift stores, secondhand shops, yard and estate sales… just about anywhere you might find a bargain. I have some great collections that I constantly search for more pieces: china, pyrex, fabric, furniture hardware, old sewing notions and pin cushions, old Macintosh computers and accessories, crystal, interesting old jars and liquor-type decanters for my planned chandelier in the entry way… yadda, yadda, yadda. It is so true that one person’s trash is another’s treasure. Even The Kid has a couple of collections that he looks to add to, including his love of older technology and electronic gaming. Today, we headed to one of the thrift stores that we love. It is heads above many of the other shops we go, in that it is so clean and well designed and has a lot of merchandise turnover, so that you rarely see something two visits in a row. In fact, not so long ago, I had run across something that I really wanted, but for whatever reason, I decided not to buy it. A few hours later thinking about it, I decided I did want it and was worth the asking price, but by the time I got back, it had been sold. Lesson learned. So, today’s visit was particularly good. 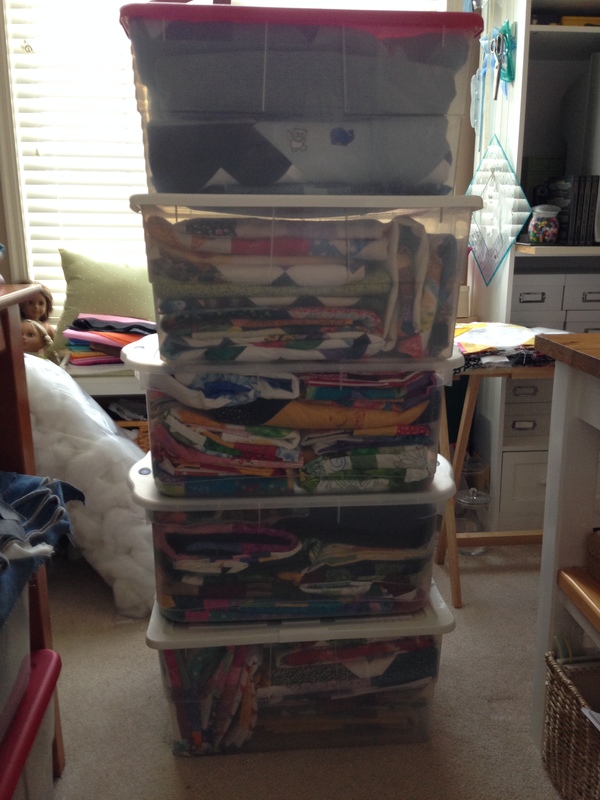 Just one more collection for the sewing room are quilting and sewing books – regardless of when they were printed. I have picked up quite a few for pennies and they are almost always awesome. I purchased a quilt book not so long ago printed in the 70’s that featured quilts with the big color schemes back in the day – how many remember avocado green, harvest gold and burnt orange? I certainly do, my mom’s kitchen was of just these colors. I believe the refrigerator and stove were avocado green, but the wallpaper – these giant leaves on a background of ivory in those three iconic colors. But if you can imagine, those colors together in a quilt were, well to put it as nicely as I can, were a massive color saturation and over abundance. They even talked about using knoits, poly- and polyblends in a quilt! Wow! Well, today’s find was a bevy of beautiful books. Most are fairly current; I’d say within a decade or so. 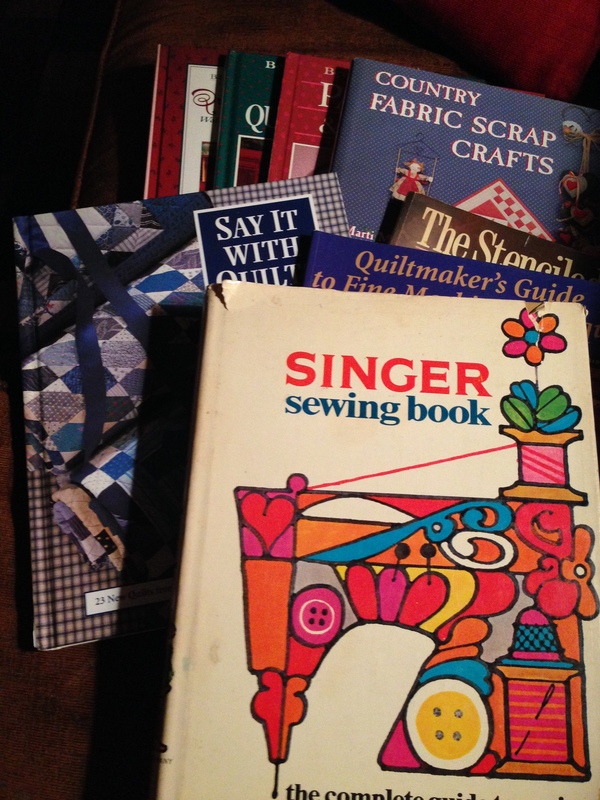 But the prize was the 1969 first print titled “Singer Sewing Book: The Complete Guide to Sewing”. From the funky graphics on both the front and back covers to the instructional information, it just oozes awesomeness! I can’t wait to sit down with it and really go through it. I also managed to find a huge amount of Pyrex, although not my collection, but rather pieces I actually love to cook with. 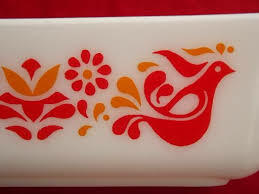 I collect Pyrex in the red and orange color titled “Friendship”. Its a tricky pattern to find, which makes hunting for it all that much more fun. 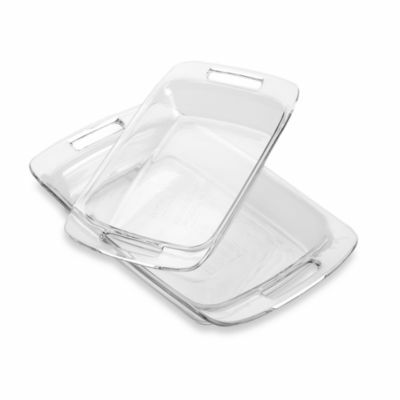 The clear Pyrex, on the other hand, is fairly common and still being produced. These pieces are workhorse bowls and pans and I use them often. I have bread pans, cake pans, mixing bowls and a whole lot more. I learned to use glass – rather than metal – for baking and I just love the nice evenness that it affords. And all this stuff is dishwasher safe, no hand washing for me! I do have a couple of very high quality cookies sheets that have never been touched with soap nor anything that could mar or scratch the surface. Sometimes, it can be a real pain. I did find six pairs of men’s jeans size 50 and 52! Let me tell you; THAT is a lot of denim! It was a tough inner battle, but in the end I feel like I need to work on using what I have before I decide that I don’t have enough and need more. I have a bad habit of over buying in anticipating a new project. I need to remind myself of that and often. Tomorrow brings the unveiling of the most recent completed waterfall-style dresser. Just screams luxury and style and elegance. Again, one more piece I wish I could keep!